Dan has been involved with the business right from its start when Dan helped Martin on the market stall. He is our chief market operative and loves nothing more than standing on Salisbury Charter Market in the pouring rain! 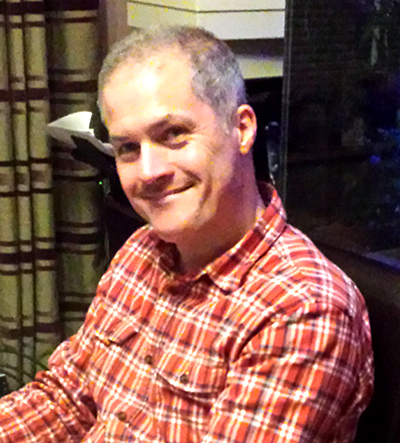 He is also our resident geek and can do anything you could ever wish for with a computer! He has created all of our IT systems and his proudest achievement is this fab website. 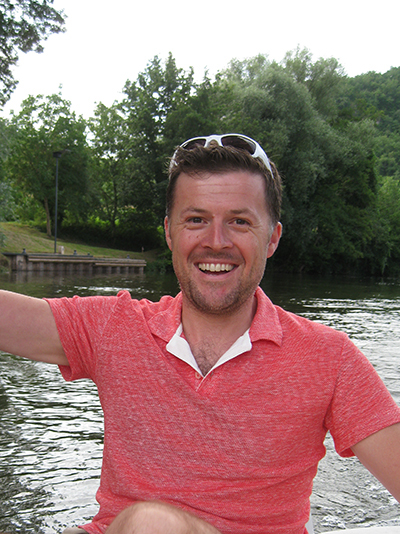 If you have any technical issues with our site, he's your man and you can contact him directly here at dan@wiltonwholefoods.com When not at work he loves nothing more than relaxing with his family at home, walking his gorgeous Dalmatian Poppy, or tucking into his favourite snack, Gathia Sticks! He's also rather partial to Belgian Chocolate Brazils, but only after a burn up on his fat bike across the New Forest. Nic, Sol's wife, has been an amazing addition to our team since Martin's retirement in 2009. As a qualified Chartered Accountant, she looks after all financial and admin aspects of the business and you can contact her on nic@wiltonwholefoods.com. Nic also runs her own accounting service helping small companies with their payroll and accounts. She delights in keeping a tight reign on both the Rimer boys at work, but at home she loves spending time with Sol and their three children. When not ferrying the kids about, taking them to sports clubs, swimming, parties or gymnastics, she can be found pounding the city streets in her running gear. When Nic does get a few moments to herself, she loves shopping for clothes, drinking white wine and reading interior magazines! With her experience and background working in the food industry, Caroline is our hygiene, food safety and Health & Safety expert. Her career thus far has involved helping food companies achieve BRC and ISO standard accreditation, so we know our company is in safe hands with her on board! She also carries out all our staff training and ongoing self audits. When not walking around the factory with her clipboard, Caroline loves spending time with her three girls and husband, baking the most delicious home made cakes! Aaron, Malcolm and Steve are the engine room of the nut factory! Together they pick, pack, unload, organise, store, deliver, mix and supervise the production process and logistics for the business. In his role as Packaging Manager, Steve has undergone thorough training enabling him to run the packing room like a well oiled machine! 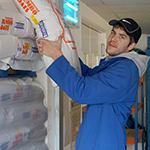 Aaron is Steve's right hand man, always on hand to to keep all our packing lines topped up and ready to pack! Malcolm is the master of the warehouse. 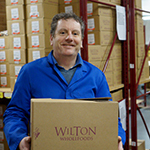 With his specialist training in warehouse management, he makes sure every order is picked and shipped and the warehouse kept stocked up and products ready for despatch. He also heads our team of friendly delivery staff, so odds on if you get a delivery from us to your shop, you'll be greeted by Malc's smiling face! Bethany, Hazel, Sharon and Tracey are our ever dependable packing room staff. Together they have over 30 years service with us and are all invaluable to our business. As our longest serving employee, Hazel runs one of our semi automatic production lines, packing all our delicious dried fruit. Whilst standing at her station, she loves nothing more than bossing about Dan and Sol, singing along to her favourite tunes or simply dreaming about her next holiday to America! Sharon works on one of our fully automated lines and has been with us for over 8 years. She packs most of our pulses, grains and oats, but as long as the music's on and she can finish work in time to look after her horses she's happy! Tracey, Hazel's daughter and Steve's older sister is our hand packing expert. Since joining us, she has become our cherry queen and is never happier than facing a mountain of glace fruit to pack! Bethany is our newest recruit and has fitted in perfectly since joining. Working next to Sharon, Bethany also operates a fully automated packing line, adding her dash of style and panache to all proceedings! Helping Dan every market day are Julie and Louise. Louise has been with us for over 12 years and when she's not serving the customers on the stall in Salisbury, you'll also see her doing her weekly delivery run either to the North of Wiltshire or along the South Coast. When not at work, Lou's one true love (apart from him indoors) is her motorbike, and there's nothing she likes more than a Sunday ride out with her biker friends! Julie joined the team a little over a year ago. She loves working with the general public and when not in her Wilton Wholefoods' uniform she also works for Henderson's bakery and runs her own gardening business. As you can guess, Julie loves being outdoors, so come rain or shine, she'll be there to see you on the market!